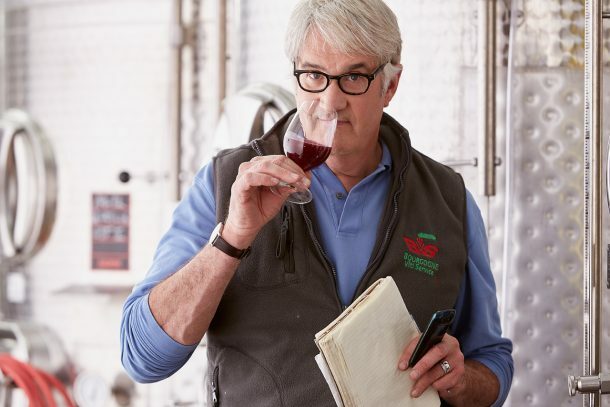 In Niagara, Bachelder has found a neat little barrel cellar tucked away in the vines on the Beamsville Bench, but the grapes have been sorted and processed at Southbrook Vineyards from day one. Bachelder has secured some excellent sites on the bench that stretch through Beamsville (organic), to Vineland on the way to the St. David’s Bench. The Niagara wine is sourced primarily from the organically-grown (but not certified) Saunders Vineyard (Beamsville Bench) and the Wismer vineyards on the Twenty mile bench. Lowrey Vineyard is on the St. David’s Bench and is the original vineyard of ‘Alliance,’ the international partnership that at once preceded and inspired Le Clos Jordanne. Bachelder Oregon is made at rented cellars at the Carlton Winemakers Studio in, well, Carlton, Oregon, and at 12th and Maple in Dundee. Working with fruit from both the Sandstone and Volcanic (Basaltic) strata that predominate in Oregon, BACHELDER is able to capture the fruit and coax perfume and elegance out of the famously-concentrated Oregon Pinot Noir, and find the stunning savoury minerality of Oregon Chardonnay in all of its lacey purity. Bachelder project has been lucky to source mostly organic fruit from great sources like Lemelson (Yamhill-Carlton AVA) and Johan Vineyards, as well as Seven Springs and Jesse James Vineyard (Eola Hills AVA). Other great vineyards include Durant n Dundee. With their two young daughters in tow, Thomas and his wife Mary Delaney have unwittingly become wine gypsies, following their passion to produce terroir-revealing wines from these two most noble Burgundian grapes. Québécois by birth, Thomas’ family hails from the dairy farming belt east of Montréal (l’Éstrie), where the Bachelder family owned two farms for as long as anyone can remember. Just three years after his marriage, he went off with his young bride to study in Beaune, Bourgogne, to become a vigneron. Domaine de la Créa (Beaune); Domaine Marius Delarche (Pernand/Aloxe); Ponzi Vineyards (Oregon); Château Génot-Boulanger (Meursault) all formed him. Subsequent start-ups in Oregon at Lemelson Vineyards and in Niagara at both the Burgundy/Niagara joint-venture Le Clos Jordanne and, later at Domaine Queylus all enabled him to discover and honour precious new world terroirs, just as vital, just as fragile and just as important. “The pebbles will always be there – but we now know for sure that the dust is gold dust – Chardonnay and its precious lands lie patiently waiting to be rediscovered. Bachelder is a small winery with cellars located in three of the world’s classic cool-climate Chardonnay regions: Burgundy; Oregon and Niagara. We strive to make pure, mineral wines from the Chardonnay and Pinot Noir grapes, elegantly-respectful of their individual terroirs.